Home Pageantry NO.1 REGIONAL CULTURAL PAGEANT IN NIGERIA TO CLOSE REGISTRATION SOON. NO.1 REGIONAL CULTURAL PAGEANT IN NIGERIA TO CLOSE REGISTRATION SOON. 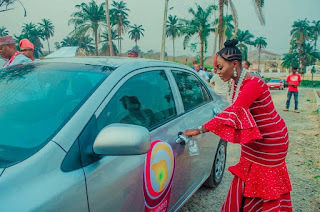 The prestigious 2018 edition of Nigeria no.1 regional and cultural beauty contest, Queen Moremi Ajasoro Cultural pageantry, has opened the sales of registration forms ahead of its forthcoming contest this year. This was made known to our reporters during a exclusive media chat with the organiser. The registration period according to the organisers, will close on the 20th of October. Therefore, interested contestants are advised to pick up their forms, because there might be no extension, she stressed. 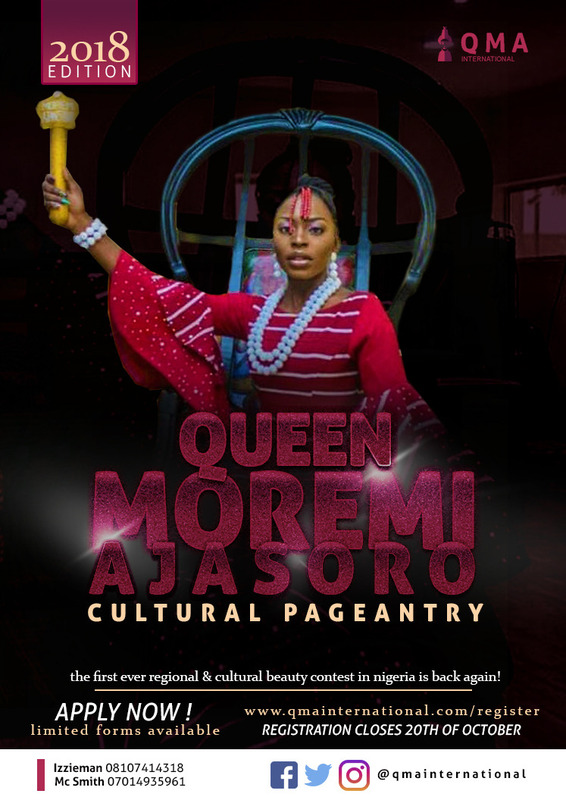 Queen Moremi Ajasoro Cultural Pageant is one, amongst the few beauty pageants in Nigeria and Africa that is structured with glorified contents to promote the cultural heritage of Africa's giant. The QMA pageant is known for its exclusive display of cultural feats, traditional fashions/styles and also a composition of intellectual contestants, who are integrated into becoming ambassadors of our cultural identity. 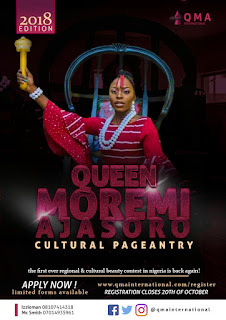 Queen Moremi Ajasoro Cultural Pageant is a contest, every well thinking young girl or model with a vast understanding and interest in national culture, must be keen to participate in.